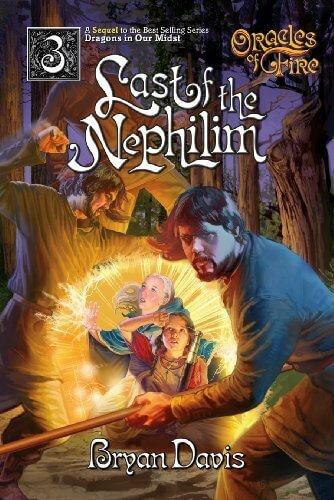 The Last of the Nephilim is a book continuing the Oracles of Fire saga. This book tells the story of Second Eden, a land begun by the Creator to escape the corruption which plagued Earth. Now, a pitched battle takes place between the evil in the universe, and the good left in Second Eden. This book is very good; better than the first two in the series. Second Eden is not a land like Earth. In the book, its founder, Arramos, was named Abraham and commissioned by God himself to populate this land. All residents (who formerly lived on Earth) are born in the Birthing Garden, from tiny pod plants. They are given companions, which are basically visible consciences. But a battle is wracking the peaceful land of Second Eden. Flint, the outcast from Abraham’s village, has called down powerful Nephilim from heaven, and a prophecy warns that from Abraham’s village a lie will be told, resulting in the beginning of a war over Second Eden. The lie is told, and a ceremony brings forth not an old ally but a powerful enemy: Goliath the Dragon. Elam and Acacia, who were sent to Second Eden by Enoch the Seer, are now ordered to call all former dragons to battle the evil dragon, who has allied with Flint, the rebel from Abraham’s village. This order brings Billy, his father, and Sir Patrick to Second Eden. There, they meet Ashley, Walter, Roxil, and Thigocia, who have recently returned from an adventure of their own. Father Abraham embarks on a journey to recover his lost sheep, Angel (the woman who told the lie), whom he had no choice but to expel to Flint’s village. There, he sacrifices himself to protect the people of Second Eden with a flaming wall of fire. The Nephilim have been destroyed, and thus far our heroes have managed to fend off the dragons. But Flint is building another army; with powerful allies. When the wall of fire is gone, who will protect the villagers in Second Eden who remain true to the Creator? While all of this is happening, Bonnie and her mother, Irene, are fleeing from Devin and Mardon, who want to use Bonnie to unite heaven and earth and complete their scheme. With Sapphira’s help, they flee to the caves in Hades where Sapphira was born. There, they discover a portal to Second Eden, and having heard of Enoch’s command, they try to enter and help the others there. But when their plans go horribly wrong, some are left behind in the caves. They must contact all the dragons still on the Earth. And time is ticking for those in Second Eden – the wall of fire protects them, but their enemies have powerful allies. The entire future of this world is cast in doubt as this book closes. That’s a confusing summary; but then again this is sort of a confusing book. There’s a lot of jumping around between dimensions, and things just aren’t as clear and well-written as his other books. Still, the lack of much that the Bible talks about means that a lot of this book isn’t suspect theologically, at least. I definitely enjoyed this book much more than the first two in the series – I was happy that Davis kept stuff from the Bible out of the book. Anyways, if you have read the first two books in the series, The Last of the Nephilim is a book that cannot be missed. It continues the exciting story begun in The Eye of the Oracle, and is well-written. Any fan of Bryan Davis or fantasy will enjoy this well-written story that continues the journey of the Oracles of Fire. I recommend that you check this out from your local library and give it a read. It seems strange that Christians would be open to such a buck rogers/lord of the rings transformation of Biblical characters. it also seems odd to have people with names from the bronze age mingling with people named Bonnie and Irene. Also Abraham, Enoch, and other people didn’t live at the same time. seems like a stretch. or maybe there is something of worth here. i dunno, haven’t read it. check out my page- I’m interested in what you think of my philosophies. Unfortunately, too many Christians read stuff like Harry Potter and I think Christian writers feel like they have to compete with that. They might feel like they have to add in a bunch of stuff to make it more exciting. We’ve changed, when you can watch more exciting stuff on television, who wants to sit and read about it? This is coming from someone who went without a t.v. most of her childhood. And I also enjoy clean sci-fi. I guess what I’m saying is… the book doesn’t sound like some good old fashioned Chronicles of Narnia. It sounds like it has a lot of stuff that young adults wouldn’t understand. But again, I haven’t read it. @Jacob: One of the things the book series does that I’m not a big fan of is that it borders on reincarnation and eternal life, sort of. So it’s perfectly normal for there to be a thousands of year old “boy” named Elam helping Billy and Bonnie fight, or something. Again, this also allows Enoch (who is in the bridgelands awaiting heaven) to interact with the people down below through the ovulum. I agree; this series comes nowhere close to the Chronicles of Narnia or the Space Trilogy. Andrew, thank you for reviewing my books. You have said some kind things about my writing, and for that I am grateful. I appreciate the fact that you’re analyzing the stories for theological and thematic content. Every reader should be as careful as you are trying to be. I think that you’re providing an important service. You have expressed some concerns about the theology and how events square with the Bible. I would welcome questions on any point. I have tried hard to make sure I never contradict Scripture, and I hope that the content honors God in every way. If you would like to discuss some of your questions and comments, please feel free to email me bryan (at) dragonsinourmidst (dot) com. Maybe we could even do an interview format for your blog. Email is best for me, because I might not get a chance to see any response here. May God bless you as you seek to serve and honor Him. I will drop you an email – thanks again for commenting! Well, this series has been high on my priority list, since my brother insists I should read it 🙂 So it is on the top of my to-do list. While I think we do have to be very careful how we portray biblical characters, I think there is also a pretty broad margin for creative license. There is a lot the bible doesn’t tell us about its biblical characters. The Chronicles of Narnia are classics, but even they are not without fault (though it is hard to find any). And in the end, Narnia shouldn’t be our standard for Christian authors. As one just trying to begin this writing journey, I have been intrigued with this site. Mr. Davis, very cool of you to respond to your readers. As a Christian, I love Scify. I believe we serve a God who is creative, inventive, and exciting, all of the things I love about the genre. CS Lewis’ Perelandra series was one of the most profound writings I have read, outside of Tolkien. Since I’m trying to fashion my own scify novel I understand how hard it is to be creative and worldly. I would like to read this series. It sounds fun. I have lots of mixed feelings about these books. I think that though many of the things that have been said here seem contradictory, they may not be. Yes, this comes nowhere near C.S. Lewis’ books, but then I don’t think anything can. I don’t think these books have anything that will lead people away from God or draw their focus to ungodly things like many books and movies have that are out there. On the other hand there are those who might get confused by some of the theology. I don’t think we should base our theology on fiction, though some fiction can help us understand certain things. We have to be careful which things we take away and what we leave and I think the only way to know is to always go back to the Bible. I think with books like these, we can take away the lessons characters learn and leave the more questionable things relating to who people are and how long they live. I like the story, but I think it would have been better to put it in a setting away from real history. It’s safer and would be less likely to mislead those who are already uncertain. One of the main arguments against these that I have heard has to do with the dragons. My friend did not like the idea of dragons being portrayed as good. I think her objection had to do with the fact that Satan is often portrayed as a dragon. I don’t fully agree, but I’m still trying to sort it out myself. I have no problem with dragons being real. I think they’re the same as dinosaurs (Job is definitely not describing a hippo or elephant). I am enjoying reading the books, I love all the different personalities of the characters. I think it’s great how they develop and grow but still retain their individuality. The conflict between people is realistic (considering their circumstances) and the dialogue is great. The author really does a good job with emotions and tying the whole thing together. (though I found the moving between the different places confusing and it was hard to picture where the characters were moving to and from especially as there were apparently more than one world? )I did like the plot and the characters, I just wasn’t sure about the setting. It is a four part blog series, and three of the four posts are up. this week the last blog post will be installed.